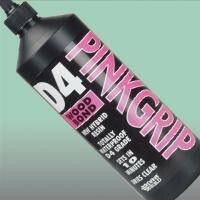 Wood Bond D4 is a solvent free industrial grade D4 wood adhesive based upon the latest hybrid resin technology. Can be used internally or externally, gives a high strength, totally waterproof, impact and temperature resistant bond that is usually stronger than the wood itself. Ideal for wood working, joinery and commercial assembly work. Dries clear. Easy water clean up. Sets in ten minutes. Totally waterproof when fully cured. Solvent free Pinkgrip is quick-curing, food-safe and over-paintable when cured. E. & O.E. see T&C - We do try to keep prices and specifi­­cations of Pinkgrip Hybrid Resin Adhesive correct, but mistakes can be made!